Cut off my right hand? Is Jesus coming in the clouds? Will this really happen on earth? When? This passage refers not to an anticipated event, but an event that has occurred on a spiritual level: “By ‘the clouds of heaven’ in which He is to come, nothing else is meant but the Word in its literal sense (which sometimes hides/obscures the true meaning such as a cloud obscures the sun); and by ‘the glory’ in which they will see Him, the Word in its spiritual sense (in which all is revealed)” (Apocalypse Revealed §24). The Writings for the New Church give us the spiritual sense of the Word, which descends through the clouds, and then the literal sense becomes accessible and applicable. Did a flood cover the earth? The story of Noah and the flood is not a literal story about life being wiped off the earth, but rather a story that represents the personal struggle and temptation that each of us faces in life—and the ways we can protect ourselves in these times of spiritual trials. 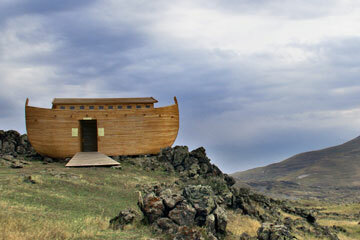 The book Secrets of Heaven explains the inner meaning of this story: the ark that Noah, his family, and the animals go into for protection from the flood represents the church that carries us through hard times (§639). “By the ‘flood of waters’ is signified the beginning of temptation” (§739-740). The flood represents the temptations that come in life and threaten to wipe out everything good if we give in to them. 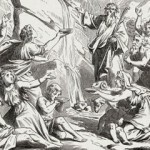 It is further explained that “‘Noah went into the ark, from before the waters of the flood’ signifies that he was protected in temptation.” In the story Noah’s wife, his sons, and his sons’ wives came with him into the ark because they represent the resources Noah had to help him resist temptations. 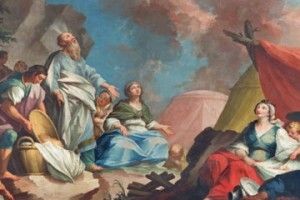 Noah’s wife represents goods, his sons represent truths, and his sons’ wives represent truths that are connected to goods (§742). We can see that while the story seems literally impossible it stands for something very real in our lives—turning to the church and the goods and truths that sustain us when we are faced with temptation.